Being a busy mother is a full-time job. You have to run after your kids, take care of your house, and possibly juggle all this in combination with a busy working schedule. Many moms say they simply don’t have time to do anything, let alone follow an exercise program. 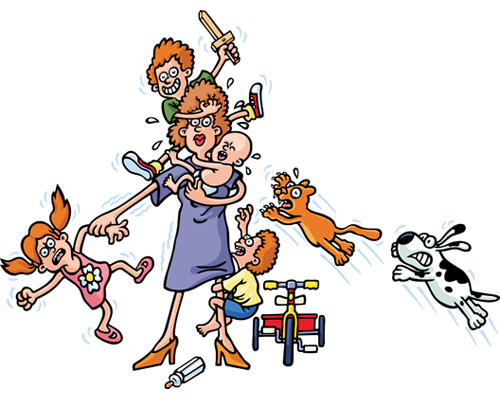 Here are a few tips for busy moms to stay fit and balance this with being an awesome mom! If you struggle to find free time, one quick tip is to be busy together with your kids. If you have a new baby, take them for a nice long walk at least three times a week in a stroller. There are also special strollers made for joggers. It’ll be a nice day out for your baby, and you can squeeze in some exercise. If your kids are a bit older, you can find outdoor activities to do as a family. Kids love being outdoors, and they would love a nice long hike or renting bikes for the day. Strive to do this at least twice a week and you will stay active together as a family. No time to go out? Another option is to exercise at home while your kids are napping, playing, or doing homework. Invest in a workout DVD, follow a YouTube video, or do basic exercises by yourself. You can invest in minimal equipment like dumbbells and elastic bands. Another option is to do cardio on a treadmill, bicycle, elliptical, or any other machine in front of the TV. Watch your favorite TV show while working out, or you put your kids’ favorite cartoons to keep them busy while you exercise next to them. Have you researched if your local gym offers classes for kids? A great idea would be to enroll your kids in a fun class and work out at the same time. Your kids will be active and make new friends, while you wll have some time to exercise. Instead of taking the elevator, use the stairs. Instead of having someone carry your groceries for you, carry them yourself. If you can walk to work or walk while running your errands, then leave the car at home. Try to replace leisure activities with being active. Instead of watching TV, go for a long walk. This is one quick and easy way to get more exercise without even realizing it. If you really have no time or energy to exercise, one final tip is to eat clean. Restrict junk food to once or twice a week only. Let the bulk of your meals consist of protein, wholegrain carbohydrates, veggies, fruits, and healthy fats. This is one way to fuel your body with energy and to feel great. There are tons of recipes that are healthy and delicious. You will only ever gain weight if you eat more calories than you burn, but if you follow a well-balanced diet then you will happily maintain a healthy weight. How do you stay fit with your busy schedule? We’d love to know! Please share your tips in the comment section below.